Axe Throwing is The Perfect Gift! We all know gift ideas can be tricky. We also know they can get caught up in the same routine. The pressure for the perfect gift is never fun. As much as a good coffee from one of your favourite vendors is nice – we believe nice just doesn’t cut it. We want to help give you a gift that is new, edgy and entertaining. A gift where your special person will be running to get to. 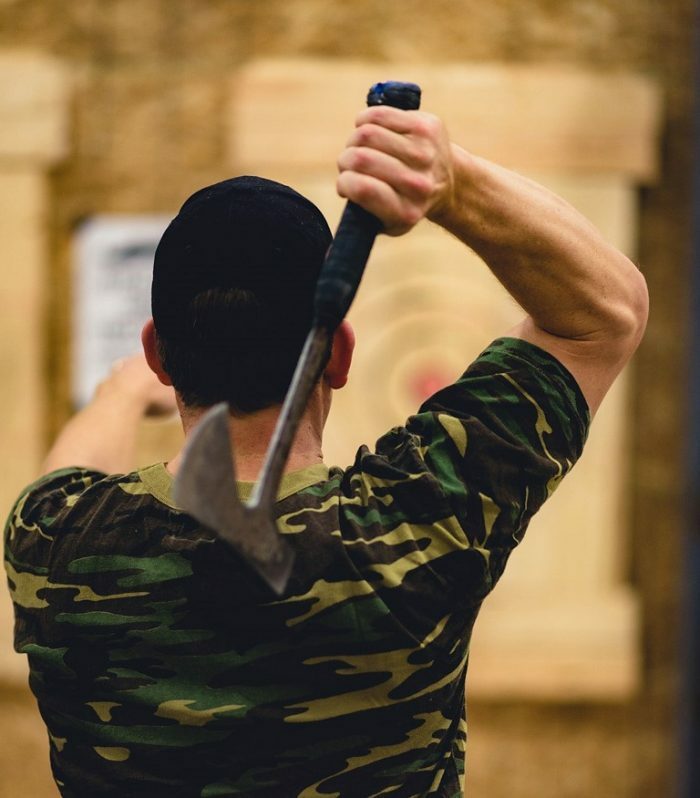 A gift certificate from Bad Axe Throwing is that perfect gift – give an axe throwing experience makes you feel strong and full of energy. We love showing you a good time because you are important to us. And we think that’s a pretty awesome gift to give someone you care about. No event is out of reach for us, whether its a birthday, someone getting married or you want to just say thank you, we are happy to help you create a memorable experience for that special person. Here at Bad Axe Throwing we are all about fun and entertainment. We are set to bring out the kid in you through our games and competitions. The place will echo with laughter, enthusiasm and pure joy. We aim to keep your spirits high while you aim for the target! 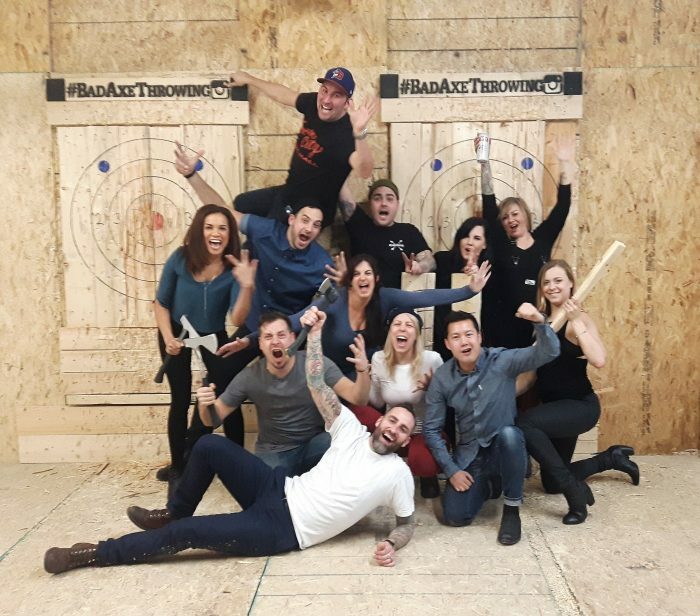 The rush of urban axe throwing has become very popular and has allowed us to successfully open 10 locations throughout Canada and one in the U.S. More and more people are jumping on the band wagon with much excitement. Trip Advisor ranked us #1 in Fun and Games in Toronto. And for good reason, the thrill of axe throwing gets you pumped. Throwing an axe is like eating chips, you just can’t eat one. Once you throw your first axe you’ll get hooked and keep coming for more. Here at Bad Axe Throwing we welcome all skill levels and all ages (a parent/guardian is required to sign a waiver for under-aged children). Our doors are open for any events: birthdays, bachelor/bachelorette, corporate events and every other special occasion. We will get you comfortable with how to throw an axe in a safe environment and afterwards bring it up a notch with some fun competitive games. Each event is hosted by coaches dedicated to giving you a good time. And because you can’t have a party without food and drinks, we allow you to bring food and drinks (at no extra cost). So the next gift you are brainstorming about, scratching your head with, “I don’t know what to get?” Let us help you create a really cool gift for you to give. The beauty of Bad Axe Throwing gift certificates is they can be purchased electronically, no need to leave the house. Contact us directly to get a gift certificate ready for that special occasion.